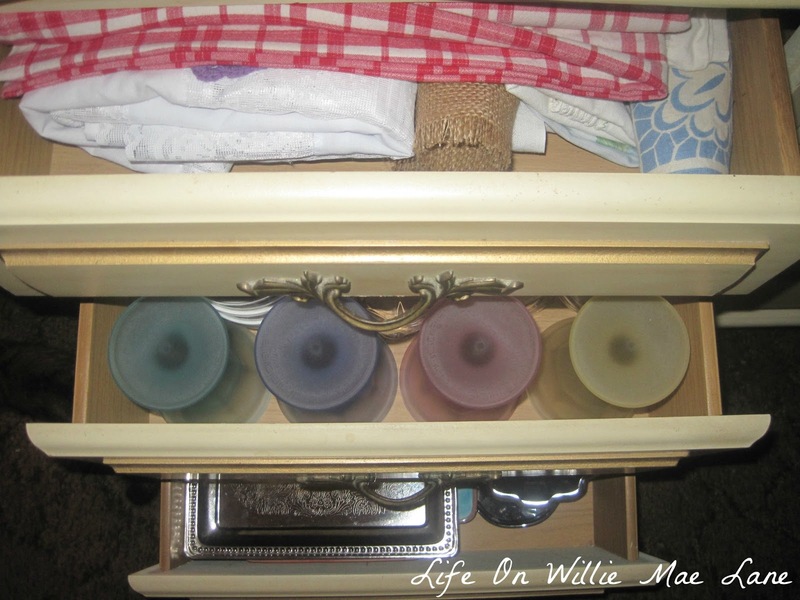 Life On Willie Mae Lane: Organizing My Drawers! 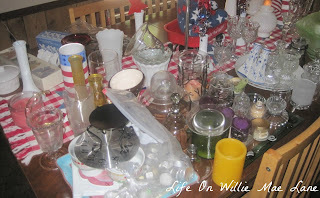 Today I am sharing a little organization post with you. I started this project Wednesday evening and finished last night. I was gone most of the day yesterday or would have finished sooner. And...as usual, I forgot to take a before photo of my buffet drawers, but the first photo below shows a lot of the stuff that came out of the drawers piled on my table\. I had just been cramming things in them and they were stuffed to overflowing. I had also been using one of my yard sale finds to store the overflow, but both of them needed to be cleaned out and organized. The second photo shows the yard sale cabinet. I took everything out and switched some things around and had enough room to store the set of white china I bought a few months ago as well. Here are the after photos. 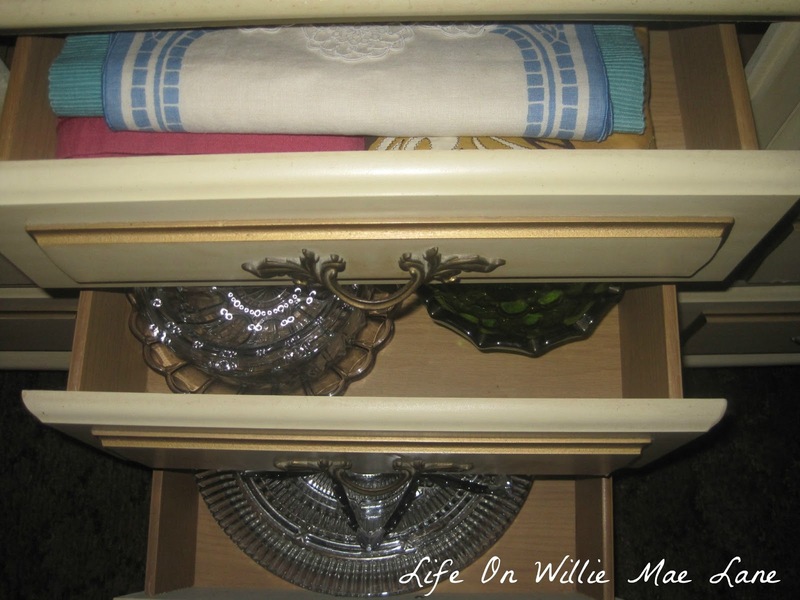 First up are the left side drawers in the buffet. 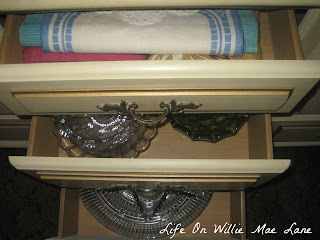 The top drawer holds tablecloths and runners. 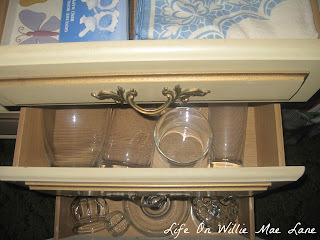 The middle one holds ice cream dishes, and the bottom drawer holds different types of trays. 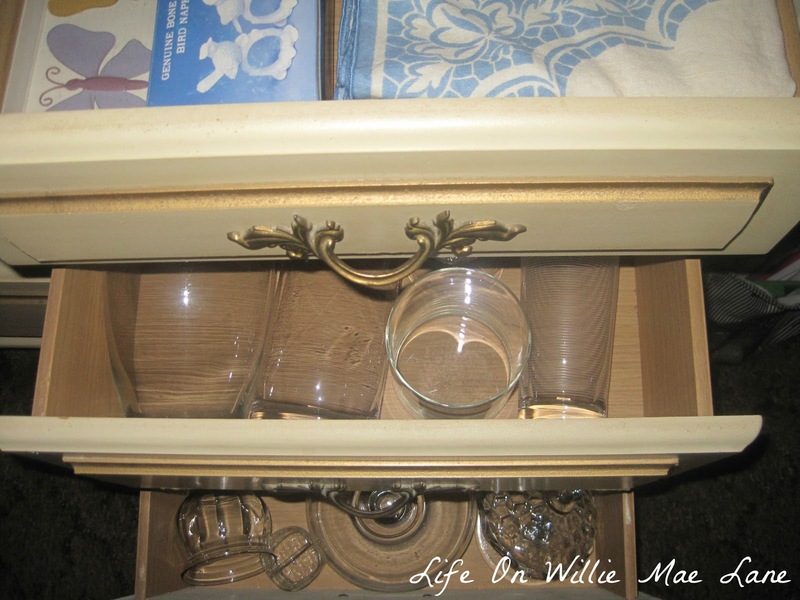 The middle set of drawers hold place mats, serving pieces, and large glass platters. The right side drawers hold napkins and rings, vases, and miscellaneous decorative pieces. Here is the inside of the yard sale cabinet. It holds a lot! 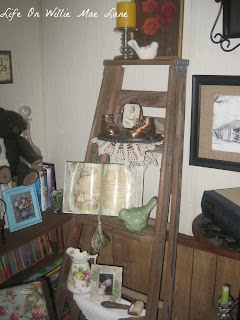 The top shelf holds candle holders, the middle shelf holds some plates and bowls along with some more candle holders and silk flowers. 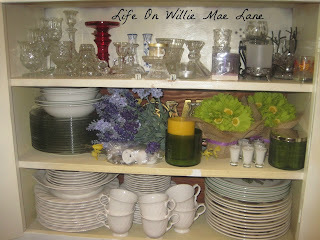 The bottom holds my set of white china as well as a set of fall & spring dinner plates. 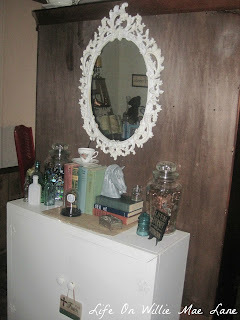 I want to put a fresh coat of white paint on this little cabinet eventually. I also want to put bead board on the back and paint it a pretty color...maybe aqua, yellow, or green. 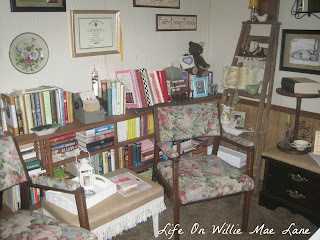 You can read how I recovered the chairs and ottoman here and here. Here is the $5 yard sale cabinet I mentioned earlier in this post! It was a great investment! I love how the vignette on top turned out as well. I love the colors of these old books. I also love my pewter horse head bookend I bought a a flea market a while back. I'm still debating on painting him. 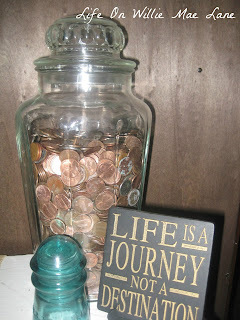 I think I will one day! 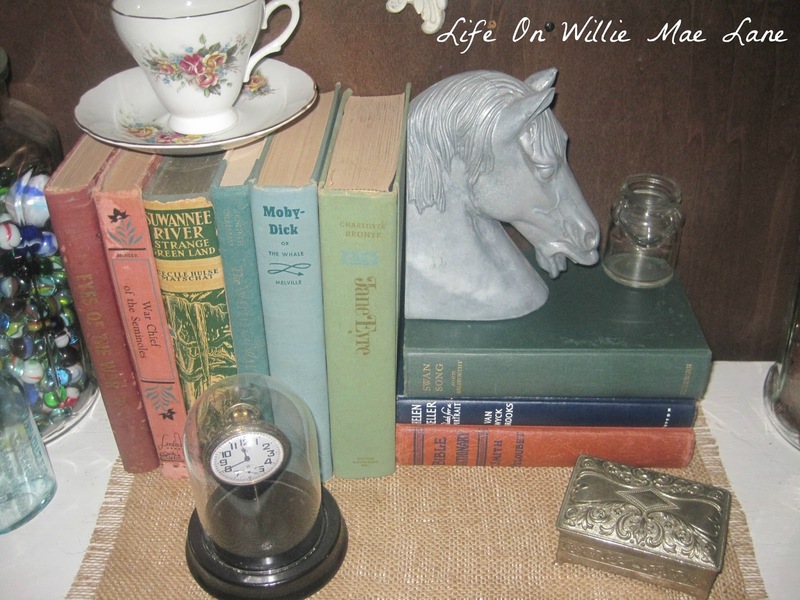 Next to the horse head is an old ink bottle and my husband's late grandfather's pocket watch hangs in the cloche in front. A pretty teacup and saucer and vintage silver trinket box finish off the space. On each side are two large apothecary jars I have had for about 25 years. They were given to me by an old friend of my hubby's family and she had them for years before that. I love the size and they are very heavy glass. Look at the pretty detailing on the lid. This one holds loose change. When it is filled, we will roll it and cash it in. Maybe use it for a small home project. A tile quote and a small, old insulator round this side off. Love the color of the insulator! The left side jar holds my son's old marble collection. He had some really pretty ones that I couldn't bear to part with. I'll have grands to play with them some day! 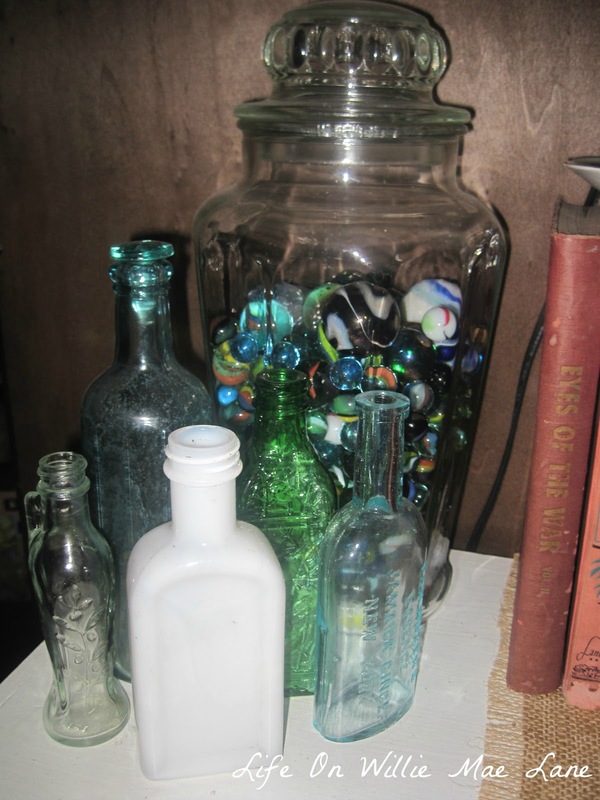 Also on this side are several old bottles that my Granny Pauline dug up herself. 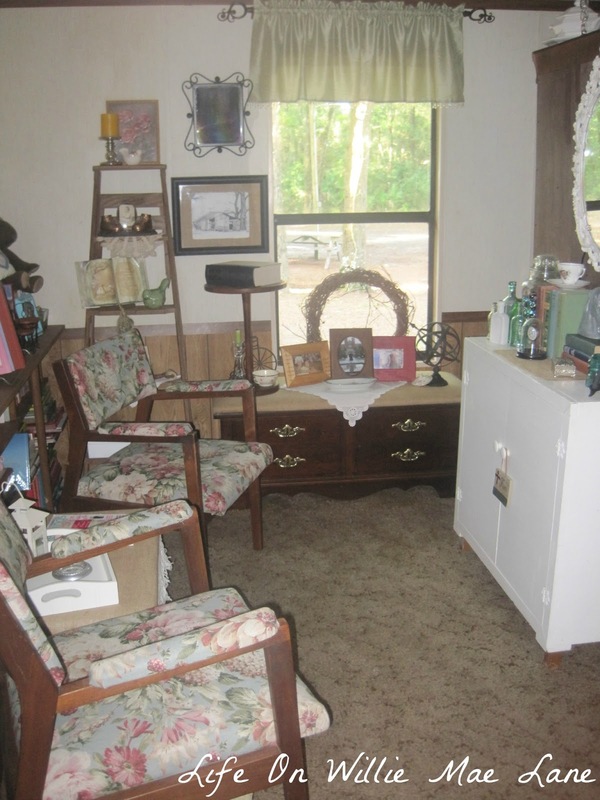 She loved to dig for treasures and had a huge collection of old bottles and arrowheads. You can see several of the old bottles here. The tall aqua colored one with the stopper is a favorite as well as the white one! Well, I better get up and get busy! I have more projects on my Summer To Do list! Oh....just in case you didn't see it, please go read this post if you might be interested in guest blogging for me! I would appreciate it greatly...:) Thanks to the ladies who have already contacted me...I am so grateful! Vicky, your storage is pretty organized! I think you are doing a great job in your home. We have to find places for our treasures wherever we can find them. 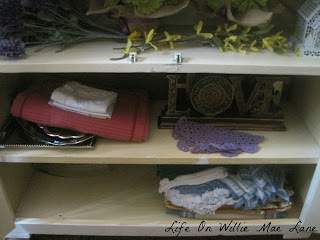 Love the vignette on top of the white cabinet!! 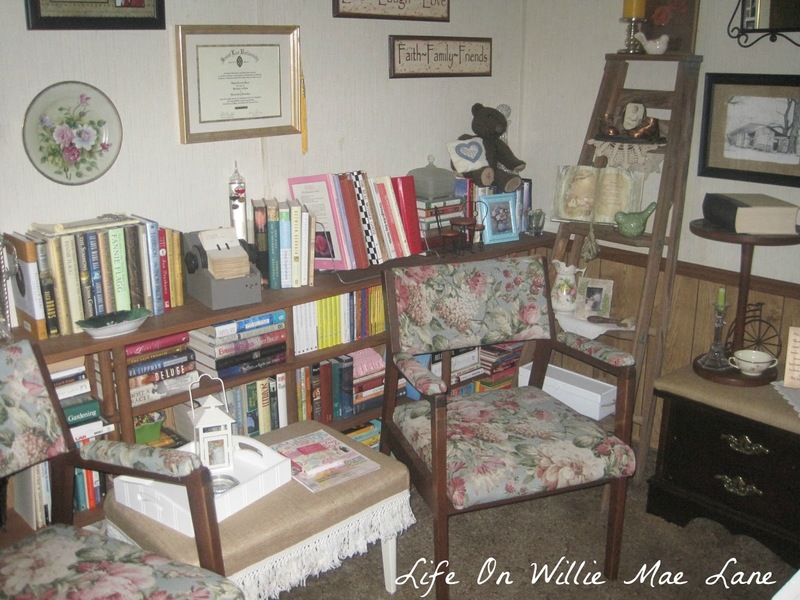 Ah, the joy of an organized home. I think I could use a little of that right about now. 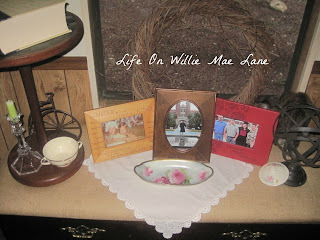 Your vignettes turned out so cute!